Here King Arthur Pendragon,Titular Head & Chosen Chief of The Loyal Arthurian Warband explains the Campaign he and his Order spearhead at Stonehenge for the return and re-interment of the Ancient Human remains known as the Guardians. In August of 2008 we were asked as Druids and Pagan Priests, to ‘Bless a dig’ at Stonehenge for the removal of a number of cremated human remains for scientific analysis, in order that they may be studied and carbon dated, a two year licence was granted and later extended by a further five years. An extension that we opposed in the Royal Courts of Justice, calling and failing to receive a full Judicial Review, of any such decision to extend the licensing period. For the last five years we have conducted a campaign, gathering signatures for our petition at Stonehenge, to ensure the Cremated Human remains re-exhumed from one of the Aubrey holes encircling Stonehenge, are re-interred in what should have been their final resting place; where they had laid for over five thousand years, until they where first disturbed in the nineteen twenties. That all changed in 2008 when they were re-exhumed for scientific study and our campaign has been to ensure that they are returned after such testing has taken place. We have never opposed the examination and carbon dating, once they were removed, but have steadfastly campaigned for their return being made aware (through our inquiries utilising the Freedom of Information Act 2000) that it was never their intention to re-inter them despite the terms of the licence granted by the Ministry of Justice that clearly states that they should. It is and always has been their intention that they are for deposition in Salisbury and South Wiltshire Museum. 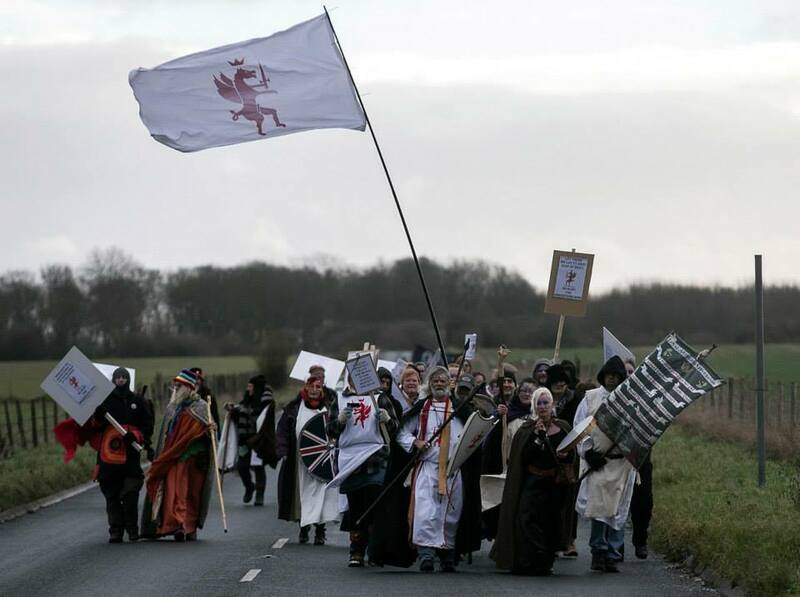 On 18th December 2013 English Heretics opened their long awaited New Visitors centre at Stonehenge ‘amid controversy’ as we protested against their display of human skeletal and cremated remains, excavated from the environs of Stonehenge in what amounts to ‘Trophy cabinets’ likened to a Victorian ‘peep show’ one skeleton displayed upright. Looking like something that would be more at place in a fairground Ghost train than viewed at a World Heritage site. EH were quick to announce to the worlds press that these particular remains were not the ones from Aubrey hole seven. No in part they are from a subsequent ‘dig’ Aubrey hole 32: They are most assuredly, still taken up from the cremation pits encircling the Temple; whilst others are excavated from the surrounding barrows. What, however; EH neglect to say, is that under the agreement made with Salisbury and South Wiltshire museum and the Duckworth museum in Oxford (and I know, I have a copy, again courtesy of the Freedom of Information Act) that any human remains excavated from the environs of Stonehenge may be displayed on a three month turnaround. So you see they are being very economical with the truth in deed. For us, it has never been a strictly Druid or Pagan issue but one of common decency and respect. We believe the ancient Dead should be given the same respect as the more recent dead and that they should be allowed to rest in peace and we have during the past five years gathered support from all corners of the globe and from representation of 61 world religions. Christian remains are protected under British Law and no one would dream of displaying the recently excavated remains of Richard the Third, but alas pre-Christian remains are not, a reflection back to the age of Christendom when we were regarded as a Christian Nation. One avenue we are looking into is actively campaigning for a change in the LAW, so pre-Christian remains be afforded the same protection. We suggested a compromise that Replicas could be displayed in their place but EH have insisted on displaying the ‘real thing’. I shall deal here with the arguments arrayed against us. There first and main argument seems to be that only the real thing will do and that EH have a duty to provide a link with history in the name of Science and Education. We would argue that there is no need what-so-ever to display the ‘real thing’ and that with the advent of 3D printing replicas can be just as compelling in the interests of Science and Education. ‘The Red Lady of Paviland’ displayed from 1969 til 2008 in the Welsh Museum in Cardiff, wrongly labelled. Not only is she in fact a 'he' but he is a cast copy provided by The Natural History Museum and despite being re-labelled in 2008 as a copy still remains one of their most viewed exhibits. They will cite a flawed and outdated poll of museum visitors to say that people expect to see Human remains, perhaps they do in museums but had they have asked ‘the man in the street’ did they wish to see them displayed I feel they would have received a very different answer as is borne out by a more recent (Nov 2008) poll of the Readership of a regional newspaper The Western Daily Press; where 93% of those who responded, agreed with my submission that Replicas should be used instead. The Archaeologists argue that there is nothing like coming face to skull with the ancient dead and some even insist that ‘Pagans’ wish to commune with the dead in museums. Seems more like Dennis Wheatley than modern Paganism to me. And in any event, one skeleton is much the same as another in appearance and there are plenty of opportunities for those who wish to view the dead to view more recent skeletons that where left to medical science. These human remains, and it should be remembered that dead and buried is still dead and buried however much time has elapsed, they are still dead and they were still buried whether last week, last year, last century or over 5,000 years ago. Buried by their peer group over 5,000 years ago with the expectation of laying there in perpetuity, they on the other hand certainly were not left to medical science and had no such verbal, tacitor written agreement as may exist in the present day. English Heretics market Stonehenge world wide as an ancient burial ground and place of worship, the leading Archaeologists refer to those encircling the Henge, that we call the Guardians, as either a Royal line, the Priest Caste or the very architects and builders of Stonehenge. This makes them in my view the founding fathers of our nation, the very giants on whose shoulders we sit. We do not think it too much to ask that they be returned to what should have been and what should remain their final Resting Place. We will continue to challenge and to fight for their return and re-interment at Stonehenge and we shall continue to oppose their display at what is a World Heritage Site. We believe that English Heretics are ‘out of step’ with world opinion and views, that favours repatriation and re-interment as opposed to display. Hardly a day goes by without reading of indigenous Nations around the Globe challenging Museums for their Ancestors remains. We support their struggle and will not rest until ‘our collective’ ancestors are in like manner laid once again to rest.